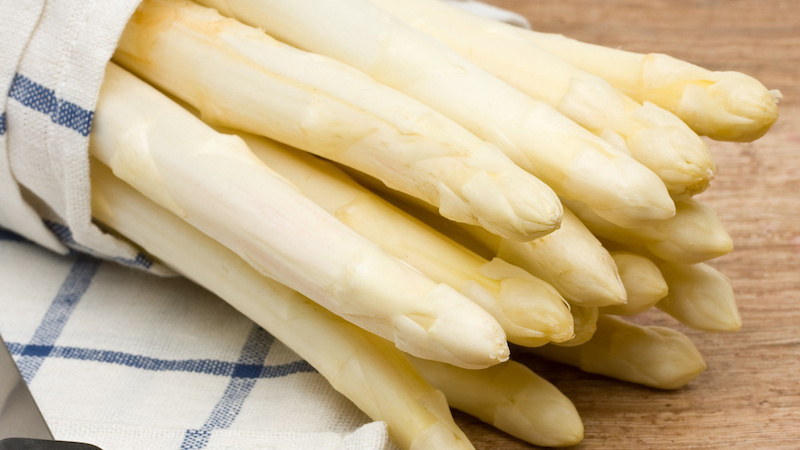 Large parts of Europe celebrate the first appearance of white asparagus in the springtime. There are even entire festivals to mark the season. Just because we live in Thailand doesn’t mean we have to miss out. Each year in spring, Casa Pascal offers giant white asparagus in Pattaya and includes them in a variety of traditional dishes. White asparagus is grown underground. Growers cover the spears in mounded dirt or black plastic tunnels to avoid exposure to light. As a result, the plants do not produce chlorophyll and therefore don’t turn green. White asparagus is also considered to be slightly milder in flavor and a bit more tender than green asparagus. One of the traditional ways is to eat them is with your fingers, dipping them in hollandaise sauce. There are green and sometimes even white asparagus from the north of Thailand available. These asparagus are not of the same quality like those from Europe. They are small and thin. Their taste is bland and the texture too soft. Some places serve white asparagus from Chile. They are somewhere between their Thai and their European cousins. They are a little bit bigger and firmer in texture than Thai, and thinner and less flavorful than European asparagus. At Casa Pascal, we celebrate asparagus season each year with imported giant white asparagus from Europe. We serve them traditionally with either Hollandaise, Mayonnaise, or Vinaigrette. We prepare them a variety of ways. Some of each year’s favorite dishes are the asparagus with foie gras and asparagus with parma ham. Have a look at our specials in the spring and find out why we have become famous for asparagus in Pattaya.